Recently, I scanned some pictures and I though it was nice to share them here. 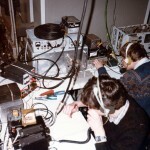 Four of them are of the VHF/UHF/SHF contest station that we ran between 1981 and 1987. The first location was abandoned because of blocking trees. The latter location was on top of a school building with a superb take-off. We had a modest setup with only about 10 Watts output, but many top-3 finishes in our category. 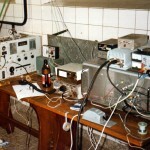 The last picture shows my QTH in JO20XX around 1992 (before I moved away September 1994). I wish I still lived there, because the closest neighbours were about 100 metres away on our side of the road and only two houses across the road. 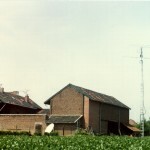 The QTH was surrounded by farmland, noise levels were very low. 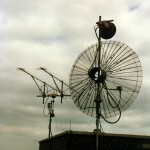 You can also see a satellite dish of 2 metres, used to receive various satellites. My XYL liked the wide variety of programmes, many of which were unencrypted at the time. It was well before the DVB era. 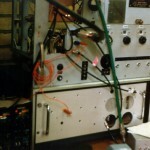 A close up of the antennas on the tower can be seen here: antenna memories.